Many years ago a major British brewer bought a little Czech brewer shortly after the fall of the Iron Curtain. 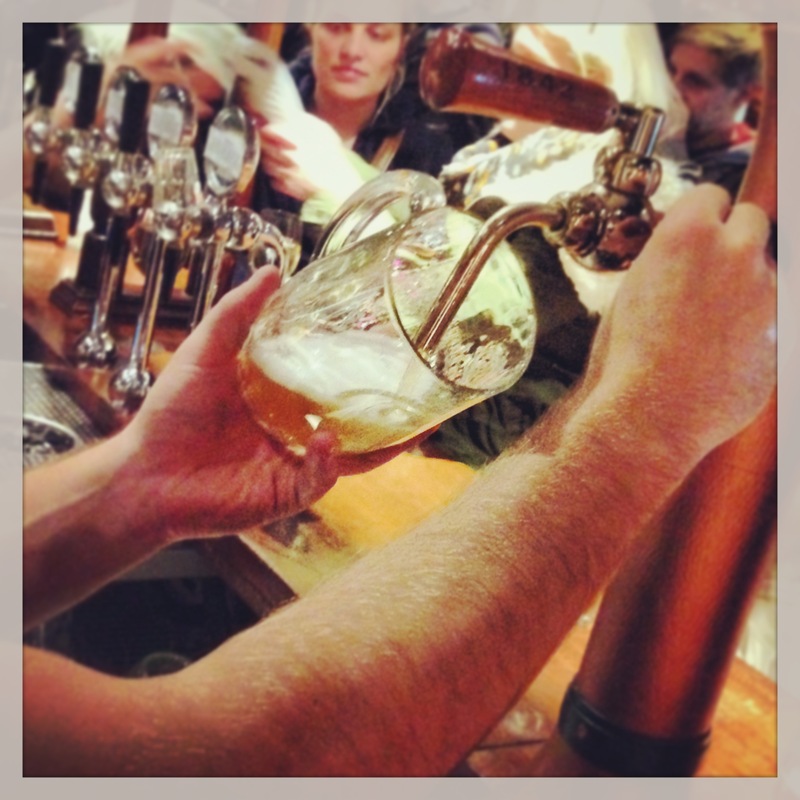 The brewer was the eminently pronounceable ‘Bass’, the acquisition was the eminently unpronounceable ‘Staropramen’. The plan as I recall it, being on the periphery of events at the time, was to leave the beer well alone but doing something about the name. Something shorter. A trim bar call. Something… well, something pronounceable. Fortunately, that plan was kyboshed by the Chairman of the company who issued an edict: “And don’t go calling it ‘Star’ or something’. The rest is history (so far). From a branding point of view, having a snappy, often short, typically horizontally aligned brand name is the desired state. ‘Avis’ is an often cited example of good practice. Strong colours; able to fit easily within your eye line and most importantly, memorable and pronounceable. Brewers though like to stick a hop stained finger up at such ‘rules’. My personal favourite was a German beer that my old company imported from Germany. Its name was ‘Treffliches Altenessen Gold’. The ad line was a witty, “Treffliches Altenessen Gold. Ask for it by name”. Alas, the powers that be did shorten that one to ‘T.A.G.’. Czech beers too, do a good line in naming tongue twisters: to an English speaking tongue, they are difficult to say; to an English seeing eye, they are difficult to read. All of which adds up to their beguiling authenticity. Less typical is finding a British or American beer that plays by the anti-brand rules. They do exist though; indeed I was lucky enough to drink one of them this week. The beer in question is an American classic, now imported to the UK by a British classic, Adnams. 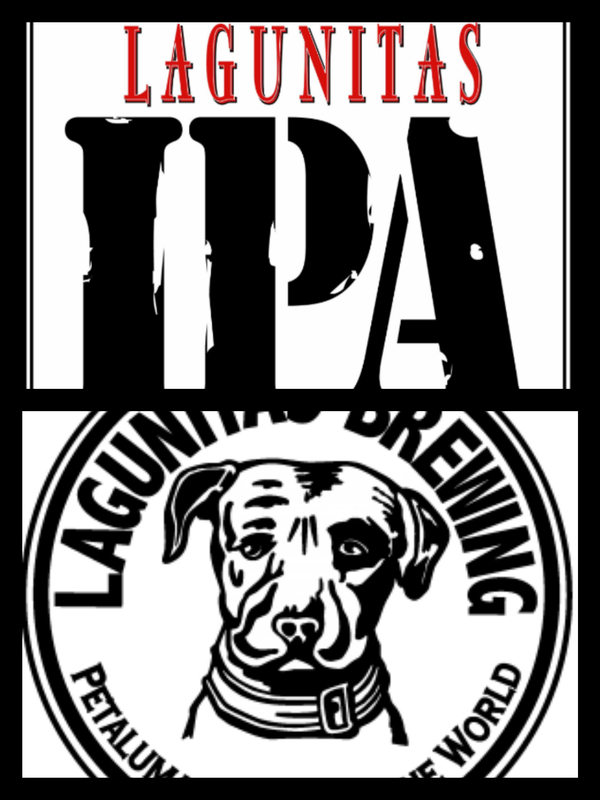 The brewery in question is Lagunitas Brewing Company; the place of origin Petaluma, California. Let’s deal with Petaluma first: to get there we need to travel twenty odd years into the past and many miles distant to the wave lapped Lincolnshire coast. Not that Petaluma is near Grimsby, but it’s through a Grimbarian connection that I first came across it. Petaluma is an area of South Australia known for its fine wines. My brother, being manager of a wine and spirits warehouse in Grimsby, conspired to buy some Petaluma Chardonnay with damaged labels which were declared unfit for sale. From there it found its way to me and my association with Petaluma was made, and the connection was very Antipodean. So it was ruddy great surprise to pitch up in Petaluma in 1999 on a holiday in California. Quite threw me it did, what with it turning out that there’s a Petaluma in northern California too; and that this same American Petaluma is in the wine producing area, where they too, make fine wine. All we need now is Grimsby to be twinned with Petaluma and my hippocampus shall explode in shards of shrivelled grey matter. But it’s the beer I’m interested in and that beer is Lagunitas IPA. Or rather, as it whispers on the label, ‘say…. “lah-goo-KNEE-tuss”’. Ok, maybe I’ve been pronouncing it wrong, but I know that my taste buds aren’t deceiving me: Lagunitas IPA is an absolutely classic American IPA. I’ll go further, it’s a bell-weather for its style. Cascade hops feature heavily in the mash but lightly in the finished beer. The aroma is grapefruit; pure, clear, uplifting. The beer pours with a rolling cloudy density that clears to leave a dense foam; a foam that mollycoddles the aroma, protects it, focuses it. The tell-tale tree rings of a fine beer are left as you drink it. For a beer of 6.2% alcohol, its punch is delivered through a velvet glove and dances around the ring of your taste buds gently, not feeling too inebriated, leaving you wanting another. Little wonder that this is one of America’s larger craft brewers. Little wonder that this is a celebrated beer. Little wonder that only one word can sum it up: Mag-nif-i-cent. 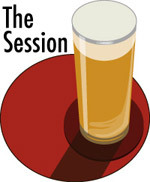 The Session #81. Women and Beer: Nothing To See Here, Folks. Here we go again. If you have been awake during the last ten years of the craft beer revolution then you can’t possibly have missed the growing narrative around women and beer. Be it the failed launches of beers aimed at women; be it the Second Coming of the Female Brewer (should I say, ‘Brewster’? ); be it the hefty punch carried by many female beer bloggers; be it our first female Beer Sommeliers. 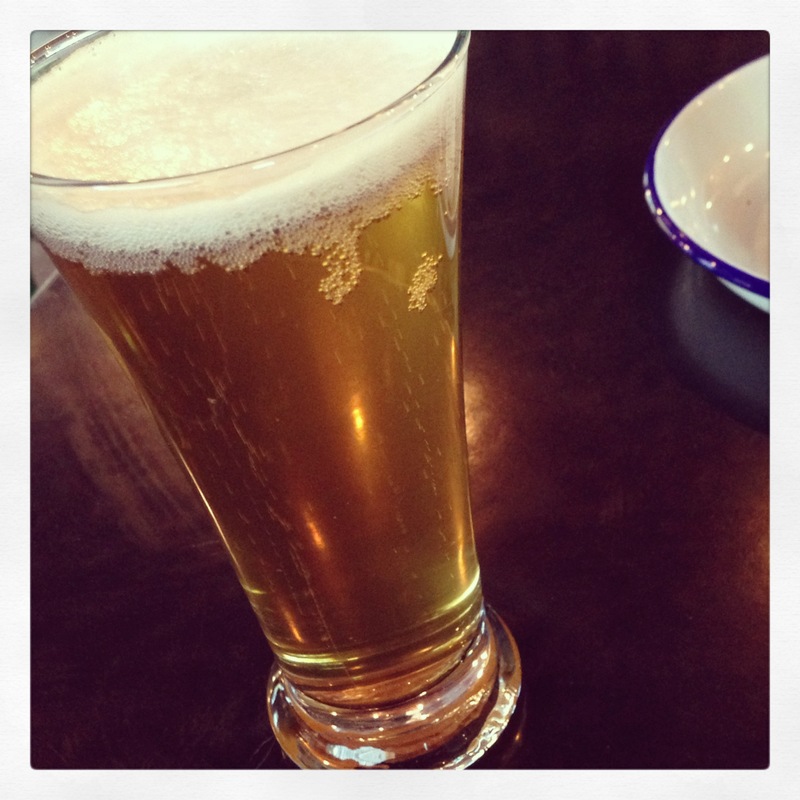 In truth, I’m tired of it: not as a bloke, but as a lover of beer. It’s a no news story. Let’s take the first side of the topic: ‘Scary Beer Feminists…?’ Well I’ve met some Scary Feminists. And in the world of work, I’ve met as many nasty, bile-filled and spiteful alpha women as I have nasty, bile-filled and spiteful alpha males. That’s life. But in the world of beer where beer is celebrated, not just a big bucks business: the craft, cask, micro, flavourful, blogging world, all I’ve met are enthusiasts. Men and women, ardently pushing their case; why their beer is the best beer ever brewed; why their town or region is the hottest of brewing hot spots. Sometimes this ardentness pushes into the female:male gender debate – for example, why the growth in brewsters is simply a rebalancing; getting back to a pre-industrial time when women did the brewing, and therefore this is a good thing because women are regaining their rightful place at the ‘brewing table’. Well, it is a good thing, but a good thing because sufficient numbers of women are now interested enough in good beer without all the stereotypical, schmaltzy, nostalgic arguments that run along with them. To the second side of the topic: ‘…or a Healthy Growing Demographic’. Women are just over half of the population worldwide. It tends to be slightly more because women live longer than men, so let’s just park that right there. The ‘issue’ with beer and women isn’t about demographics. It isn’t about blokey advertising, although I’m sure that hasn’t helped. It isn’t about the ratios of male to female brewers. It most definitely isn’t about the taste of beer; I dare anyone who encounters the salami and smoked roast meat flavours of Aecht Schlenkerla Rauchbier not to find it extremely challenging when they first try it. I dare anyone not to find an American double IPA a full-on experience when they first try that. What I do see is many, many women trying beers like these and more besides, just as they would a new spirit, or a wine, or a coffee. Why the hell not? No, the issue is culture. Take the UK: whether it was agricultural labourers or factory labourers after the Industrial Revolution, what you were selling was hard, physical, graft. No holidays, long hours, miserable conditions. Women worked in the fields and they worked in the factories: my gran worked in the Cheshire cotton mills all her life, almost lost her sight through a flying shuttle and her fingers cleaning out the looms which they did without switching them off or slowing them down, weaving the cloth at full pelt. But overall, it bred a working population dominated by men, unburdened by the travails of childbirth (if I think my gran had it tough in the Mills, she was one of 14 siblings – spare a thought for her poor mother, two decades in almost continual child birth). It was a society of exploitation: of long hours and pitiful wages; homes were poor, often cold and dirty. The man would come home; eat; then go to the original ‘Third Place’ – a pub or club, to drink. And drink in quantity. I don’t believe the change with regards to beer and women has much to do with the craft / cask revolution. I do believe it has a lot to do with our post industrial society and the behaviour that it breeds: approaching equality in many more aspects of our home and work life. Is it too big a leap to expect beer to follow? Is it too big a leap to think how creative people don’t see beer as an opportunity and are getting after it, be it as a brewer, a sommelier, a writer or someone who just wants to try new things. As far as I see, the healthiest thing for beer would be to make this a non-issue and move on. Celebrate it all. Gender. Creed. Beer Apostle or Beer Atheist. Man, Woman or Vogon. That’s what I intend to do. Author David PrestonPosted on November 4, 2013 Categories Observations, The Session2 Comments on The Session #81. Women and Beer: Nothing To See Here, Folks. It was Slati Bartfast, the planetary designer in The Hitchhiker’s Guide To The Galaxy who was particularly proud of his handiwork in penning Norway’s fjord coastline (“the fiddly bits”). Rightly so, he did a cracking job, what with their soaring cliffs, spouting waterfalls and magnificent base jumps, if that’s your thing. In fact, I find the map of the whole North Atlantic fascinating, from the mouth shaped bite of Scapa Flow on Orkney, to the fine filigree fingers of the blustery Shetlands and the Faeroes with their whale-backed mountain ridges, arching as if ready to dive. Then beyond, to Svalbard and across, to the land of ice and fire itself: Iceland, precariously perched just below the Arctic Circle on one of the world’s most active volcanic boundaries. Iceland has always fascinated me: when I was younger, it was the Norse mythology, the Cod War and the Sagas, many of which are set on the island and spelt out the lives of the brave wanderers who had upped sticks and island hopped until they settled on what we now know as Iceland. It shows how tough these characters were when you consider that they thought the island verdant and warm compared with where they had left. In fact, it’s said that those original Norse settlers called it ‘Iceland’, despite its greenness to discourage further immigration and leave more of the land and resources to them. In an ironic twist, Erik the Red, later banished from Iceland for sundry pillage, brawling and fornication related misdemeanours, settled on the icy landmass he found further west and called it ‘Greenland’ to attract more settlers (before buggering off yet again and investigating the coast of today’s Labrador and Newfoundland). I went to Iceland in 1991 after leaving University, to dig pits, study soil and ice sediments, measure glacier melt and do various climate-change related activities in the days before anyone seemed to be bothered about that sort of thing. What I did not do was drink beer: firstly due to a lack of geographical proximity to any licensed premises and secondly, because I was poor and beer was – is – tear-inducingly expensive. For the first four weeks, I stayed on a farm in the far north, Dalvík. Our party, split into two: one half, my research tutor, his wife and young child stayed with a farmer who they had known for many years. The other half, me and a small party of German researchers, stayed on a deserted farm a few miles further on. Beer was so prized that it was the way we paid for our hospitality, along with a case of good single malt. 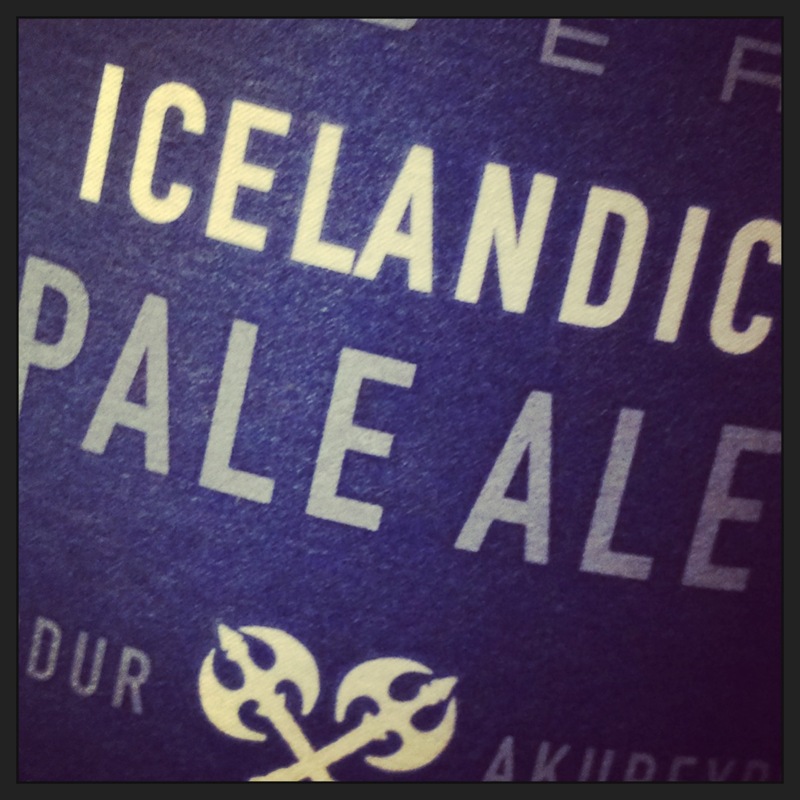 The reason was Prohibition – at the time, Iceland had only legalised beer two years prior; its strength was strictly controlled, as was who could sell it. Like many Scandinavian markets you could only buy alcohol from a Government licensed shop. And because the ban on beer had only just been lifted there were no Icelandic brewers and so everything was imported, everything expensive. 22 years on and the situation has changed. I can’t tell you this from primary research (I plan to go back soon but haven’t made it yet) but through other means, chief of which is the small but growing number of Icelandic breweries I’ve been keeping an eye on. Back in 1991, when I met my brother in the final week in Reykjavik, we pushed the boat out one night, wandering down to the sea front area and treated ourselves to a pizza and a Pripps Blå: a nondescript margherita and a nondescript Swedish euro beer but *ouch*, it dented my wallet when I could least afford it. Today though I am drinking a beer from one of the nascent craft breweries. This one in fact is close to my affections as it’s from Akureyri, Iceland’s second largest settlement and situated just below the Arctic Circle. It was the place I flew into all those years ago before heading even further round the northern coast to the farm. It was here we did our shopping; buying delicacies such as caviar in metal tubes or vac-packed puffins. It was here too that our Jeep broke down and we ended up making an impromptu meal on a camping stove from air-dried cod, turnips and a can of tomatoes, just off the forecourt of the most incongruously placed Esso filling station imaginable, before eventually fixing the engine problem with a pair of old tights. There was no brewery back then. 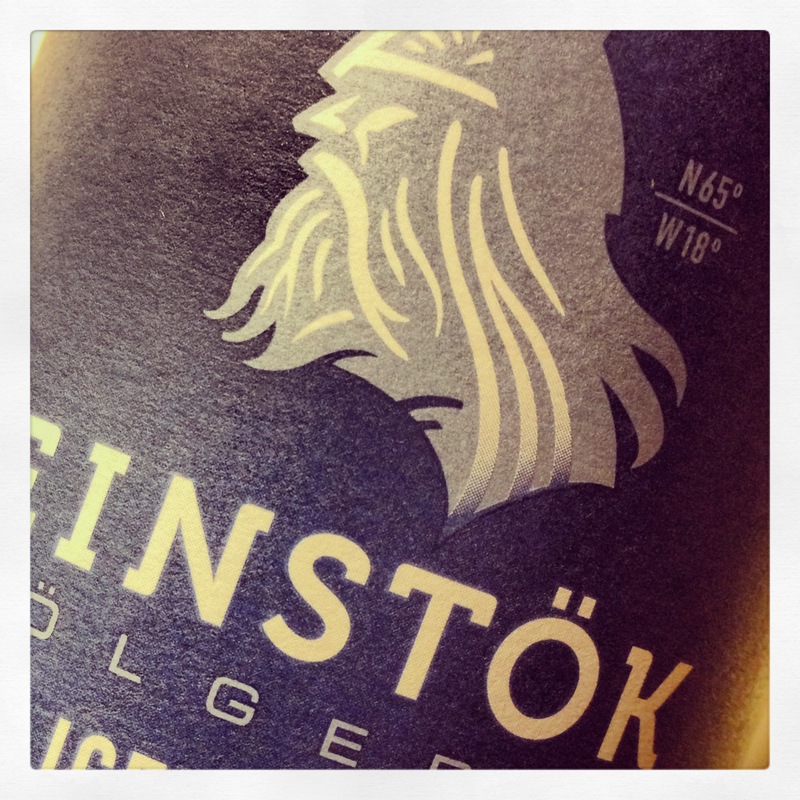 Today there are a few, including Iceland’s largest, Villifel (Viking) and a smaller, craft ale brewer, Einstök Ölgerđ. It was beers from the latter that I found in the Harvey Nics pop up shop in The Trafford Centre of all places. I bought a couple of bottles of the Pale Ale, a 5.6% affair, presented in a dark blue Scandinavian minimalist label-set, featuring some bearded bloke with a horned helmet and crossed axe detailing. All very dark ages chic. It’s a good beer: very much in the style of an American pale ale, with a melted caramel colour and a grassy, lemony, wheaty aroma and a soft, gently carbonated body with a sharp hop tang. It’s a beer perfect for these high latitude dark nights and short days, when the sun hardly seems to rise above the horizon.